Bergholz, Ohio (CNN) – Aden Troyer hasn't figured out precisely how he'll tell his daughters – now 4 and 5 years old – why they're growing up without a mother. "I've kind of held back a little bit because they are so young, and I do not want to depress them," he said from his home in north-central Pennsylvania. Troyer, his ex-wife, Wilma, and their two children are part of the Amish faith, which includes living a simple life free of the conveniences of the modern world, like electricity and motorized vehicles. But what happened to the Troyer family is anything but simple. Troyer believes that he and his wife were lured into a cult made up of breakaway members of the larger Amish community near Bergholz in rural eastern Ohio. He said it was – and still is – ruled with an iron fist by his former father-in-law, Sam Mullet, a man who Troyer and others say is anything but a typical Amish leader. They say Mullet has created rules and punishments for breaking those rules that Amish folks had never heard of before. The Amish typically resolve disputes within their community without the interference of law enforcement. But they say Mullet takes this to a whole new level. 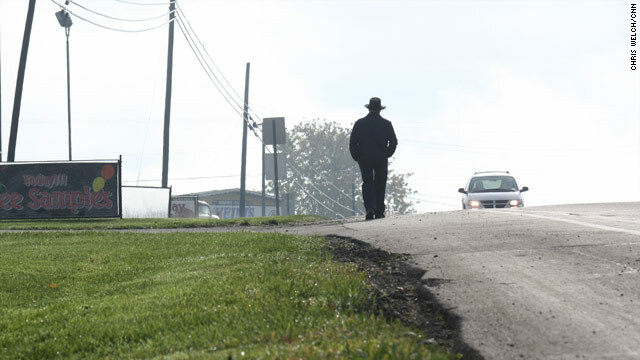 "The way he's been treating and talking to people, he is not an Amish guy," Troyer said. "He is not your typical peaceful, loving Amish person." Troyer said he eventually realized what he was getting caught up in and moved away from Mullet's compound, along with his two daughters. There's a problem: Wilma did not. Three years after their marriage in 2004, the couple divorced, and Troyer received full custody of the girls. Mullet's name emerged recently after several Amish-on-Amish beard-cutting attacks, in which most of the perpetrators are believed to be followers of Mullet's breakaway group. Last week, the FBI announced that it was investigating the incidents to determine whether any federal laws had been broken. No further details were given. Local law enforcement officials and members of the Amish community believe Mullet has created a cult and is singlehandedly responsible for orchestrating the beard-cutting incidents and other crimes in recent years. Mullet has not been charged with any crimes. To get Mullet's side of the story, I would travel to his rural Ohio compound, an hour's drive from the nearest city of Steubenville. But before getting to Mullet, I heard accusations, first hand, from the people who were once close to him. Just before 11 in the evening on October 4 at a farmhouse outside the rural Ohio community of Carrollton, Myron and Arlene Miller heard their doorbell ring. Myron Miller crawled out of bed, unsure of what he'd find. A group of men armed with scissors and battery-powered clippers attacked Miller, holding him down and cutting out a chunk of his beard, according to the Millers and law enforcement. Arlene said that when it was over, her husband's beard was "about 4 or 5 inches" shorter. The attackers targeted Miller's beard because, as a member of the Amish community, it is a significant symbol of his faith. Arlene says the men attacked her husband because he had helped one of Sam Mullet's children leave his Amish sect. "(These men) knew he was suspicious," Arlene recalled, "and just like that, just so fast, (one of them) grabs for his beard and starts pulling on him to pull him out the door." Five men were arrested in the attack, as well as another incident earlier in the day, according to Jefferson County Sheriff Fred J. Abdalla. Four of the five suspects are related to Mullet, including three of his sons. Additional arrests aren't likely because only two of the four victims of the attacks since early September - including Myron Miller - are pressing charges, Abdalla said. Going against the Amish tradition of solving conflict through their church, Arlene Miller says, she and her husband decided to report the crime to police because they hope to prevent other people from being hurt, including Mullet's followers, who "need help." "There's a lot of lives being messed up down there. There's a lot of people being abused and brainwashed," she said. Mullet's sect is made up primarily of his relatives living on and around an 800-acre compound in a remote valley outside Bergholz, Ohio, according to the sheriff. "They (have) titled themselves the 'Bergholz Clan,' " Abdalla said. "It's a cult." Sam Mullet is the undisputed leader of this group, according to the sheriff. "When I tell you nothing moves out there unless he says it moves, that is the case," Abdalla said. "Everyone takes their marching orders from him." Abdalla says he fears that this "cult" could come to a dramatic demise, as others have. "If I were to get a call right now telling me, 'Sheriff, they're all dead in the community out there,' it wouldn't surprise me," he said. "That's the power and control that he has over those people, because if he were to tell them right now to drink this poison Kool-Aid, they would do it." Abdalla has seen a lot in his 27 years as sheriff, but he says the stories he's heard firsthand from inside Sam Mullet's compound are the among the most bizarre. One came from a man who said Mullet put him in a chicken coop for 15 days in the dead of winter over a religious disagreement. The victim would not press charges. "He was convinced that (Mullet) was doing him a favor," Abdalla said. "That's like me hitting you in the head with a two-by-four and telling you I'm doing you a favor … and you agree and say, 'Yes, you have done me a favor.' That's how domineering (he is)." Because of Abdalla's involvement in these incidents and Mullet's distrust of law enforcement, the two have been at odds since Mullet moved to Jefferson County in the mid-1990s. Abdalla said he even received death threats from one of Mullet's sons, which he believes was orchestrated by Sam Mullet. "It was two in the morning, (and he's) telling me I'm a dead SOB," Abdalla said. "He was charged with threatening, harassing, what have you. He went to court (and pleaded guilty)." These stories and the terrible memory of the attack on her husband keep Arlene Miller awake at night, fearing the worst. She's concerned that talking to the media – and the fact that her husband is only one of two beard-cutting victims who has pressed charges - could put them at risk once again. "They didn't get all of Myron's beard that night, so (Mullet) is probably not done," she said. That fear has driven the Millers, like a lot of other Amish families in the community, to take unprecedented precautions to protect themselves. "We're locking doors, and we've got pepper spray and stuff like that," she said. They never kept locks on their doors in the past, a trait shared by many Amish. The "Bergholz clan" has also created a climate of fear in Amish communities well outside Bergholz and its surrounding towns. A man from Berlin, a couple hours away, who refused to give his name said he is fearful of the power Mullet wields. "If we say something and they find out, we're going to be the target," the man said. "They would come after me. It's kind of scary here. I just don't want to get involved in it." Seven miles down a stretch of winding two-lane highway, deep in a valley outside Bergholz, you have to travel along township road over a mound of mud to get to the compound of Sam Mullet. On the other side of that mound, barns and stables well past their prime come into view. A few white houses are mixed in with the farm buildings. The only sound is the occasional neighing of the horses. Next to a barn stands a boy, not much older than 9 or 10, in the plain Amish clothing: blue shirt, suspenders and trousers. He stares at me, clearly an outsider, as I drive up in a car. Another boy watches as he sits just under the barn door near what is perhaps some horse-powered farm equipment. Farther down the road, a group of younger children in the same type of clothing sit in what appears to be a sandbox. Not one word can be heard, not even a laugh. As I get out of the car, notebook in hand, the two boys disappear into the barn. Little faces, some cradled by bonnets, peer out of windows of one in the houses as I approach. A single knock at the door of a big white house at the dead end of the township road is answered by Sam Mullet, known as Bishop Mullet to the folks around here. His tall frame fills the entryway; a long, wispy beard moves in the occasional light breeze. He seemed to be a charming, easygoing man. When asked whether he'll respond to some of the charges folks are making about him, he chuckles and politely declines, saying he doesn't want to seem like he's just out to argue with people in the media. "Can you perhaps respond to these allegations that you're running a cult?" I ask. "People say a lot of things," Mullet says, a small, confident grin on his face. "Are you running a cult?" "No. It's not a cult." "What about the allegations that you're behind the beard-cutting crimes?" "Beard-cutting is a crime, is it?" Another minute or so goes by as I attempt to glean more information. He repeats his claims from earlier that people "say a lot of things" before he politely dismisses me and heads back inside. In an earlier interview with The Associated Press, Mullet said he did not order the beard attacks but didn't stop his sons and the other men from carrying it out. In that same interview, he said he should be free to punish people who break the laws of the church. Looking back on his time under what he calls Sam Mullet's rule, Aden Troyer says he was brainwashed "80% of the way." He wishes he could say the same of his wife, Wilma, Mullet's daughter. It was the beginning of the end of their marriage, and Troyer said that what happened over the course of a couple years wrecked him emotionally. According to Troyer, the trouble began when Mullet heard that Troyer was planning to move his daughter and his granddaughters out of the group over the way Mullet was "ruling" his followers. Not long after, Troyer said, Mullet began interfering with their marriage. Troyer said Mullet would ask women, including his wife, "about their sexual relationships with their husbands." "That's very atypical behavior for Amish to do that," Troyer said. "It's unheard of." He said Wilma spent more and more time with her father at his house. The two would sometimes talk all day and all night. He believes this was a tactic to get the women to a position in which they weren't thinking clearly on their own. "One day I was at work, and I got home and … he came and took her, and that was the end of it." Troyer said Mullet would allow them to be together only if Troyer gave in to Mullet's demands. Troyer refused, won custody of their two girls and moved to Pennsylvania. Since Wilma has visitation rights but chooses not to exercise them, according to Troyer, this past spring he brought the girls back from Pennsylvania to see her. Once there, he said Wilma refused to let the children leave, citing an order from Sam Mullet. The sheriff called in a SWAT team and the kids were returned to their father. "In the Amish community, no one has jurisdiction over what goes on between a husband and wife," Troyer said. "He's the only guy and only leader that I know of that ever has gotten into an Amish couple's married life." Troyer says his one regret is not being able to see the situation coming with enough time to warn his wife. To this day, he says, he holds his wife in the most positive light and says the only reason he wanted full custody was "for the safety of the children." As for how he's explained why their mother has been absent so far in their lives, he's as gentle as possible. "(I tell them) they do not need to be scared of their mother. She loves them, and she will not hurt them. I will say that," Troyer said. "But I don't think they're old enough that they can grasp what this guy is doing." In that final minute on Sam Mullet's doorstep inside his compound, I asked him about the accusation that he split up his daughter's marriage to Troyer, with rumors of several more. "Maybe you should ask the people whose beards were cut about the marriages they've split up," Mullet responded. "Can you elaborate on that? What are you referring to, exactly?" I asked. A quick chuckle, and he kindly said he was done. « Previous entryWill Jews become a minority in Israel? You made some great points there. I appeared on the internet to the subject and found most fellas will issue along with your website. An interesting case with involvement from the Feds, which Sam Mullet's attorney has declared unnecessary. i'vw be inside a "mullet compound" also. in Texas we call' em a "trailer park"
I don't have a dog in this fight and couldn't care less one way or the other. But tell me why does this idiot press of ours insist on turning the man's ranch into a "compound?" Loaded words create bias in the reader and do not communicate the news in an impartial manner. The writer should be ashamed of him or herself. It's yellow journalism. That's the correct adjective, isn't it? Greetings from Los angeles! I'm bored to tears at work so I decided to browse your site on my iphone during lunch break. I really like the knowledge you present here and can't wait to take a look when I get home. I'm shocked at how fast your blog loaded on my phone .. I'm not even using WIFI, just 3G .. Anyways, superb site! Did you know that the Amish do not have to pay property taxes? That's why they have more money than we do. Yes amish people DO have to pay taxes you idiot! They dont live on reservations like the Indians do...Dont post about things you have no idea about & just because you heard this or that. They are good people but like us they are not perfect either. Yes they do pay property tax. Oh yes they do. The Amish are good people. Unfortunately there will always be a sick extremist to mess it up for good people. I hope the police takes this seriously and sends the Mullets a message that this will not be tolerated. The Amish are good people. Unfortunately there will always be a sick extremist to mess it up for good people. I hope the police takes this seriously and sneds the Mullets amessaget his will not be tolerated. One more instance of religious extremists. Doesn't matter what form of religion it is the "radicals" are the ones that we all have to beware. To the Mullett brothers; "Thanks, I needed a trim!" To add to the story....later in the day he gave his son a "whipping" for riding a bicycle laying in my yard. His son was 8 years old and traveling with dad to work day. Dad didn't want him influenced with the fun english way of bicycles all the while he was using electric power tools. Belief sure has ironies. I have a "funny" life experiance with Amish. I contracted them for some carpentry work and was going to accomadate them with a generator and power tools. When I showed the team my setup for their work, the leader looked at me curiously and said "can't we just plug them in to your electric and use them? We can use power tools but just not own them." My reply was sure, but that is like me telling a pretty lady I can go to the hotel with you but just cant stay all night. Oh, my god! Thank god we have the money and resources to crack these dastardly attacks! also, arrest those responsible for the "hate crime" as their beards have long been a religious custom. Not true. They may work hard but alot of them are full of pride because they think they are doing it ALL by there own works! No grace in this cult! Don't let them fool you the majority are anything but Christian! Some are kind but I was called by one and cussed up oneside and down the other for exposing his dishonest business style to one of his customers! "Is beard-cutting a crime?" – Yes. It's called a hate-crime in this instance. You are punishing someone for having different values and beliefs than you have. Looks like a band of murderous pedophiles. oh, c'mon, how sad you and Scheepers have this kind of cruelty in you, ...what an insult to your mothers to think their sons could say such an awful thing.